My hunger to write again is panging, so I put some thoughts on gunning into an analogy in sports that should make sense. Bear with me. It goes like this. I think that every young pitcher who comes up through the ranks and is called up to the big leagues probably has a goal of one day pitching a perfect game. More to the point – they ought to think about it, imagine it and literally go through the motions of enacting it. I would imagine most of the great big league pitchers believe it is possible every time they step on the mound. Likewise every professional golfer dreams, imagines and plans to shoot the rare 54. And bowlers rolling the 300 game. Not just thinking about or asking “wouldn’t that be amazing”... but expecting to do it! So here is my analogy with regards to gunning a field trial - and if you believe the previous premise you’ve got to buy in to this analogy. When a gun is called up to shoot a field trial, they ought to step into the field believing that they can shoot the perfect trial. More to the point they ought to expect to shoot the perfect trial. Meaning they have thought about it and imagined it. They have played it out in their heads many times and it is the standard they hope to achieve every time they step into the field. Calm, windy and rainy days alike. This comparison may not be obvious to someone who has not participated in sports growing up. But it is a model that is utilized in business training i.e. sales, health & fitness systems, and many other things in our lives. It might be called positive visualization and rehearsal in those instances. "I promise you that every handler in the field wants the "A" guns out there when they are called to the line." Field trial gunning is a sport and requires a number of skills, not the least of which is foot work, eye-hand coordination, reflexes, judgment, and physical condition or stamina. How many fast balls, curve balls, change ups, and sliders has that aspiring pitcher thrown to get to where he is? How many putts on the practice green did that pro stand over to think that he could one day stand over a putt - unflappable under incredible pressure - and drill it dead center? I once read in a book that "Pistol" Pete Maravich shot 1,000 free throws a day at a local church gym when he was a youngster. No doubt imagining and dreaming that one day he might be on the line of an NCAA Championship Game with a second to go and the game riding on his next free throw attempt. All these, comparisons have one thing in common. There is a very real confidence that comes from high expectations and careful - painstaking preparation. The heroic feats that we witness in sports are most commonly arrived at by practice that is so diligent as to fend off any and all forms of the jitters along with negative thoughts. Spectators find it magnificent to watch such a pressure cooker and can’t imagine what must be going through the minds of athletes faced with such a challenge. And then there is the luck factor! Well even to that… most people who have achieved a level of excellence would simply say that "luck is where preparation meets opportunity." Back to field trial gunning and where I believe we are today. Before I go any farther, I must state that I stole a lot of the following ideas from a long-time field trial gun... a good one! As a fairly well traveled judge and field trial participant who also shot numerous trials in the "pre-gunning seminar" era, I can say that (depending on who you talk to) most handlers would say (some ardently) that the gunning in their interclub could be dramatically improved. I believe that there even exists an up tick in the rhetoric today because things have not only gotten more expensive but the concern and economic stress that is on everybody’s mind. It was one thing to be gunned out of a $100 trial/venture. Today that translates into being gunned out of several hundreds of dollars and up. Unfortunately, that is where we are. Those of us who continue to be passionate about retaining and improving the breed and those who simply love it as a hobby feel particularly slighted to exit - early - a poorly shot trial. The stakes are getting too high for survival tests! This is, in fact, the focal point of my writing. It is commonly felt around the country that gunning teams are "clickish". Based on a system that says: "If you invite me to gun your trial then I’ll invite you to gun my trial." And most of the regular guns in an interclub are there because they have something with which to barter. Whether or not this is always the case, there is the perception that it is so. Another perception is that guns are invited because they help with the club; or have supported the club. Although the system might work; where it fails is when you have "B" guns in the field and "A" guns sitting at home watching a ballgame because they weren’t invited. I promise you that every handler in the field wants the "A" guns out there when they are called to the line. Whether they are not invited because they don’t mesh with the team, or perhaps due to a personality conflict, we don’t care. If you are a gun captain, get them there - swallow your pride, end them a boutique, eat crow... and just get them there. Every time I have judged I have witnessed nice dogs being hurt due to poor gunning. We call it bad luck. But let’s be honest it is poor gunning. Retrieving is vital in the outcome of a trial. I am sure that judges sometimes place lesser dogs because better ones have been gunned out. Remember my focal point. "Most handlers agree on who those excellent guns are in their area. And I’ll let you in a little secret. The great guns and handlers across the country know who they are." How about a gunning team going into every trial with a goal of shooting a perfect trial? What is a "perfect trial"? I’ll come to that later. I think we should be keeping score on ourselves and as a group. Not the gallery, and certainly not handlers, but the gun team and as an individual gun. How about a gun team knowing what the final score was on a weekend trial and an individual gunner knowing what their handicap is? Even going so far as to perform evaluations on gun teams and individual gunners. Holding people accountable and holding yourself accountable is a time tested path to improvement. Evaluating talent is crucial in so many things we do and it is absolutely vital in things that are competitive. Imagine coaching division one basketball today. Your future and the future of the program depends heavily on the ability to evaluate the talent you invite into your program. Coaches know and understand that they will be evaluated on the talent they bring into their program. They know that some players have natural talent and some have great work ethics. Some even have both. Just as I said earlier that most handlers around the country would agree that they would like to see gunning improved upon (and make no mistake - they mean kill to miss ratio), they could also name the excellent guns in their area. Most handlers agree on who those excellent guns are in their area. And I’ll let you in a little secret. The great guns and handlers across the country know who they are. Unfortunately, a lot of the formalities we undergo today with regards to gunning were brought into existence, I believe, because we had some really awful guns. By that, I mean unsafe. And no one really had the courage to, or did not want to, hurt their feelings by just telling them and uninviting them. Fortunately, we have created some very helpful safety measures... but I am not talking about safety. I am talking about skill. So, on to the notion of shooting the "perfect trial". I can’t specifically define a perfect trial shot. But most of us who have been out here a time or two would know it if we saw it. It goes something like this: not a single bird missed or barely winged tipped. Only let birds go that flew in an unsafe direction. Guns should instinctively know the range and angle (called parabola) at which shot can actually do harm. Move any vehicles that would interfere with shooting before the trial begins. Always ascertain that the bird planter and spectators are safely out of range at all times. Shoot the windows and shoot them passionately - retrieves matter in the placement outcome. The correct gun takes the correct shot at the correct time. Understanding that some of these points are open to discussion and clarification, I say "great". Let’s start discussing. Conclusion: Too often I have read these kinds of stories written by someone else and thought to myself: somebody’s dealing with a case of sour grapes. I often think about some of the systems we have put in place and ask if they have really improved what we do or are they just legislative measures. Back in the day, judges and guns were very selectively chosen. Almost always waiting until someone was "more than ready" before being called up. When it comes to gunning, how do you develop the swagger of a Tiger Woods standing over a 12 foot putt on the Sunday afternoon of a major? Are we consistently putting the best the guns in the field? Would it be a bad idea to routinely evaluate gunning performance and field trials, too? 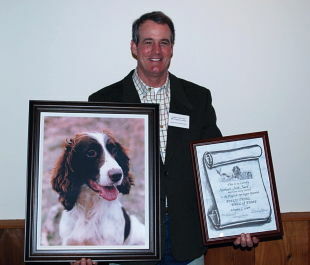 Bill Cosgrove owns and operates Ivanhoe Country Kennels where he also breeds and develops springer spaniels under the banner of Ivanhoe Springer Spaniels. Bill has been judging for 20+ years and will be judging his 5th National Championship this fall. He has championed numerous dogs and has won and placed in National events. Ivanhoe’s Irish Twist was an inductee in the BDHOF class of ’09. Bill was an active trial gun.